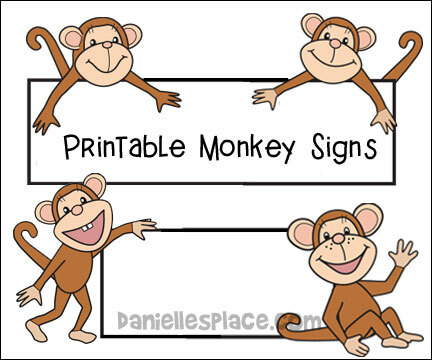 Use these Monkey Signs for a bulletin board display. Fill in the signs with anything you would like. This monkey measures almost three feet from the tip of the tail to the end of the banana. It would be great for a bulletin board display. 1. Paint two dinner-sized plates brown. Cut arms, legs, ears, and a tail from brown construction paper and glue them the top of one of the plates. Glue the plates together top-to-top. 2. Cut two ears from construction paper and glue them to one of the snack-sized plates. Glue another plate on top of that plate to make the head. 3. Fold another snack-sized plate in half and glue it to the head to make the monkey's mouth. 4. Paint the head brown with tan around the eyes and the mouth and tan with red or pink on the inside for the mouth. Glue the head to the body. 5. Cut banana shapes from yellow construction paper or card stock. 1. Write math facts on one side of the bananas and the answer on the other. Show your children the math fact. If a child knows the answer to the math fact he gets to tape the banana to the display, placing it in the monkey's mouth, hands, feet, or where ever he would like. 2. Demonstrate fractions using parts of bananas. 1. Have your children write words they don't know on the front of the bananas and the definition on the other side. 2. Write spelling words on the bananas. Ask your children to spell the words. If a child knows the answer or the spells a word correctly, he or she gets to tape the banana to the display, placing it in the monkey's mouth, hands, feet, or where ever he would like. 3. Write vocabulary words on the bananas. Ask your children to give the definition of the words. If a child knows the definition, he or she gets to tape the banana to the display, placing it in the monkey's mouth, hands, feet, or where ever he would like. Have your children write facts about monkeys on the bananas. Write the beginning of a sentence on a banana and place it in the monkey's mouth. Have your children finish the sentence on the banana and tape them to the display. There are Ten Naughty Little Monkeys but one is the naughtiest of them all. This story doesn't tell why the little monkeys are always getting hurt, but look at the pictures and you will soon discover who is the naughtiest little monkey of all. After reading the story through once, go back and look at each picture and have your children try to figure out why each monkey got hurt. Ask your children why they think the naughtiest little monkey did the naughty things she did. Also ask them how they think the naughty little monkey might have felt if one the other monkeys got hurt badly because of her actions. Talk about what the word consequence means and how the consequences of our actions affects others and ourselves. Have your children look at the facial expressions of each monkey and ask them what they think the monkey might be thinking or feeling. Encourage your children to draw monkey faces on snack- sized paper plates with different facial expressions. Label the expressions such as happy, sad, surprised, confused, scared, etc. 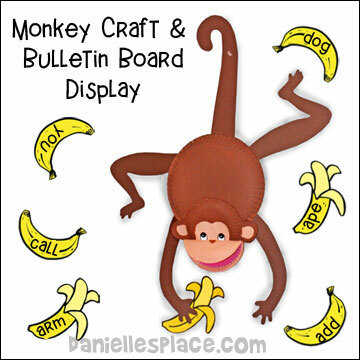 Then make a bulletin board display of the monkey faces. Read children's stories about monkeys. (See "Ten Naughty Little Monkeys" and "Caps for Sale"). Tell your children that not everything we say means exactly what it sounds like. Idioms are expressions that don't necessarily mean what the words say. The phrase "monkey business" is an idiom. Ask them what they think the expression means in the following sentence. "Mother told her children to stop the monkey business before someone got hurt." "Monkey business" is silliness or dishonest behavior. Ask your children how they think this idiom got started. Discuss other monkey idioms - Greece monkey, monkey business, monkeying around, monkey wrench, etc. 1. Print out the pattern onto heavy card stock. 2. Cut out the door hanger and color it. 3. Cut a slit just above the monkeys lower hand. 4. 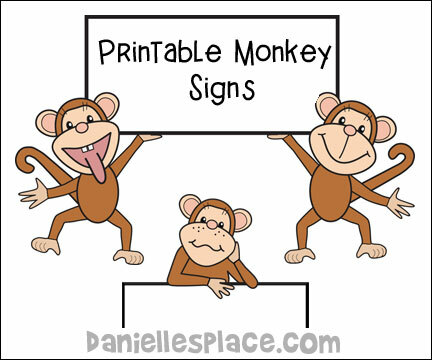 Make different signs from the left over card stock that you cut away from the pattern that the monkey can hold. Punch holes on the top of the card and tie a string to the signs. Place one of the signs in the Monkey's hand and hang it on your door. 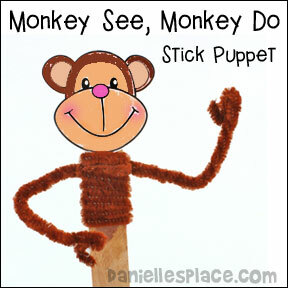 A peddler learns what the phrase "Monkey See, Monkey Do" means in this delightful, simple story. He's not like other peddlers who carry their wares on their backs, he walks around with a stack of hats on his head that he has for sale. One morning he isn't able to sell a single hat so he decides to take a nap. When he wakes up the caps are gone and he soon discovers they are on the heads sixteen chattering monkeys. The peddler tries everything he can think of to get his hats back, he shakes his fingers, stomps his foot, and then both feet, but instead of giving the peddler his hats back the monkeys just mimic everything he says. Finally he is so angry that he throws his hat down and begins to walk away. As he is walking away he sees the monkeys take off the hats and throw them to the ground. This is when he realizes that he has to do what he wants the monkey's to do and gets his hats back. "Me . . . Jane" The story of Jane Goodall for Children. This is a simple yet endearing story of Jane Goodall. It tells of her love for chimpanzees at an young age, and how she followed her dreams to live in Africa and help the chimpanzees there. The illustrations are cartoonish and childlike and set the magical mood for the story. A short biography of Jane Goodall is included in the back of the book. Your children will love this book! Ask your children what they think a peddler is after reading the story. Explain that this story was written in 1938, quite a long time ago when things were a little different. A peddler was someone who would sells things by walking from one house to another, knocking on the door, showing his wares, and trying to get the person at home to buy them. A peddler could also just stand on a street corner in a busy city and yell out that he had things to sell trying to get the attention of people who were walking down the street. Today we have door to door salesmen but most of the time they don't bring the things they are selling. Instead, they might bring a picture and description of the things they are selling or they may be selling a service, then they will try to get you to sign up for that service. 1. Have ever had a door to door salesman at your house? 2. What was the salesman trying to sell? Some examples might be: magazines, cable service, cleaning services, maintenance services such as yard work, etc. 3. Have you ever gone door to door trying to sell something? 4. Did you like selling things door to door? 5. Why do you think that there aren't many door to door salesmen today? 6. Do you think that the peddler in the story would be able to sell his caps today? Have your children count the caps on the peddler's head. Ask them if they think it would be hard to carry that many caps on your head. Have your children practice carrying caps or other soft things on their heads like the peddler in the story. See who can carry the most without dropping them, and who can sit down and get back up without dropping the hats. The peddler was selling his caps for fifty cents apiece. Look up the price of caps on the Internet and have your child figure out what the difference in price is from the story and today. Remind your children that this story was published in 1940. Ask them how many years ago that was and what was the percentage of increase of the price of hats from 1940 to today. After reading the story ask your children the following questions to see how well they listened to the story. You can make it a contest and give the child who knew the most answers an award for best listener. 1. What made this peddler different from other peddlers? 2. What did he have for sale? 3. What were the colors of the hats on his head in order from top to bottom? 4. Why did he walk slow? 5. How long did he sleep? 6. What did the peddler see in the tree? 7. What did the monkey's do when he shook his fingers at them? 8. What was the last thing the peddler did before getting his hats back? 1.Before class print out the and cut them out. 2. In class have your children color the monkey heads (one smiling with eyes open and one with it's eyes closed) and glue them back to back onto the end of a jumbo craft stick. Show them how to wind pipe cleaners around the craft stick to make arms and hands. They may also want to add legs using more Chenille stems. 3. Tell your children that they can use the arms and hands to show how we place our hands together to pray. 4. Use this craft with the following suggested books. 5. Have your children practice copying each other. Have one child move the arm and/or legs of his monkey stick puppet and have the other children try to copy the puppet using their own puppets. They may also want to use sounds and movements. This book comes with a parent's and teacher's user guide. This is a great book for children who are just learning to read.